After another successful ASUG EIM Conference, Team Utopia reflects on the 3 biggest themes and takeaways from the event. Metrics-minded leaders will often look to the numbers to prove (or disprove) success of a new initiative. But why wait until your data governance strategy and process is in place to show the value of the program? Communicating early-on with your organization’s key stakeholders allows for greater transparency, collaborative goal-setting and development of clear KPIs. Our Data Governance Partner, DATUM, drove an insightful conversation on how to identify what value your company wants to get from your data and how increasing the quality of that data and putting processes in place to keep it that way could help add net-new value. If you were to take a step back from your internal stake in the data and look at it from the view of your customers, how would data reliability offer them a better experience with your organization? How does better quality data help proactively address customer needs? What pain-points of your organization’s data stewards would be addressed or even solved with a data governance program? Thanks to friend, and long-time Utopia customer, Cardinal Health for this reminder! If you attended any of Cardinal Health’s sessions at the conference, you would have heard their team talk about how any data journey is just as much about the People as it is about the Process and Technology. By removing the silos often found around data ownership, you can build a cross-organizational team of individuals who may have different perspectives, priorities and responsibilities for subsets of the data. Check out the slide below from the Cardinal Health & Utopia joint session on Curing Unhealthy Data. This is how one healthcare organization is structuring the ‘People’ aspect of data governance and management. Digital Transformation must transcend boardroom conversation. Successful companies are recognizing it as a strategic initiative that needs to take priority. The impact of digitalization is big – and it spans the entire enterprise. We heard from SAP’s Head of Data Transformation, Maria Villar, who shared her view on the impact of digitalization on the future economy. 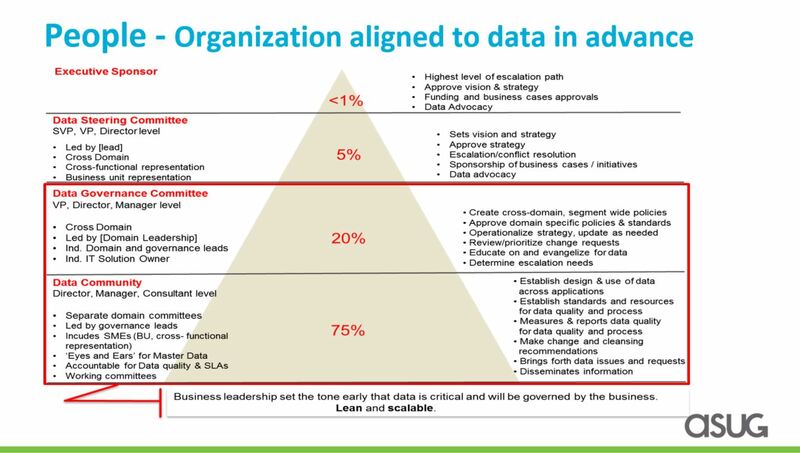 It all starts with business priority alignment where strategic business priorities are enabled by the data strategy. Customer expectations require companies to constantly innovate which means enterprise-wide flexibility. Expectations will continuously increase, so must a company’s technological capabilities. While a lot of companies understand the importance of digital transformation, just 3% of them have completed digital transformation projects across the enterprise – according to the SAP Digital Transformation Executive Study. It is time to make the transition from discussion to an action plan – organizations cannot afford to wait.